www.rockproducts.com ROCK products • July 2018 • 33 In Interlinked operation, jaw and cone crushers (cone shown) communicate with each other. Riverbend's Duff Boyd utilizes touch screen to control production. "We can go in on a daily basis and do a zero-point set on the cone," Boyd said. "The cone will screw itself down until it touches, and then back itself off. It's a super-accurate way of checking your closed-side setting. If you just go in and set it, unless you know where the zero point is, it's not an accu- rate measurement. By being able to automatically zero out your cone, you don't have to use lead weights or slugs being crushed to measure the lead to see what the setting should be. The automatic setting is fantastic; you push a couple of buttons and it's set within five minutes." The Mobicat jaw crusher design also aids maintenance, Boyd found. Like the Mobicone, it features fully automatic hydrau- lic crushing gap adjustment, which guarantees quick setup times and on-the-fly adjustments. 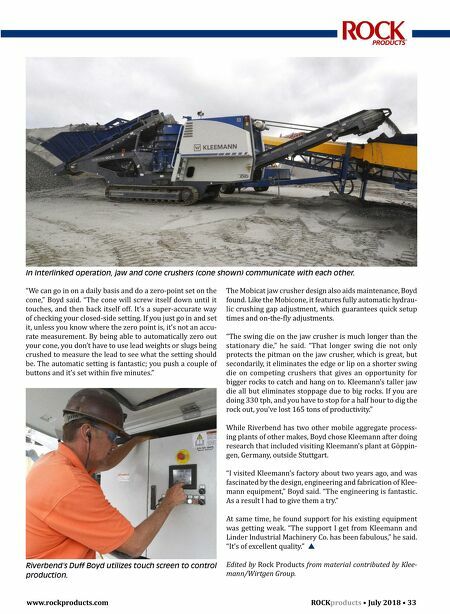 "The swing die on the jaw crusher is much longer than the stationary die," he said. "That longer swing die not only protects the pitman on the jaw crusher, which is great, but secondarily, it eliminates the edge or lip on a shorter swing die on competing crushers that gives an opportunity for bigger rocks to catch and hang on to. Kleemann's taller jaw die all but eliminates stoppage due to big rocks. If you are doing 330 tph, and you have to stop for a half hour to dig the rock out, you've lost 165 tons of productivity." 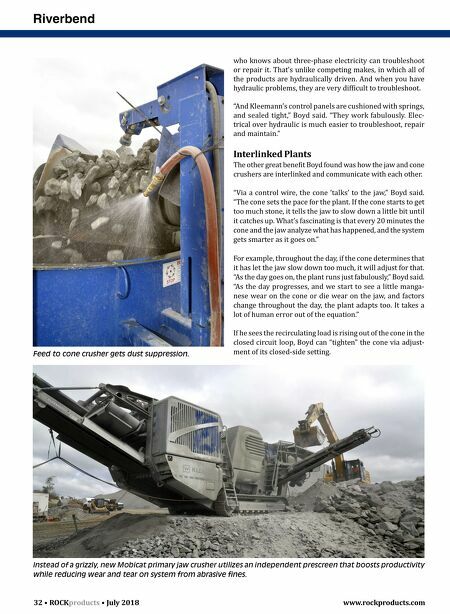 While Riverbend has two other mobile aggregate process- ing plants of other makes, Boyd chose Kleemann after doing research that included visiting Kleemann's plant at Göppin- gen, Germany, outside Stuttgart. "I visited Kleemann's factory about two years ago, and was fascinated by the design, engineering and fabrication of Klee- mann equipment," Boyd said. "The engineering is fantastic. As a result I had to give them a try." At same time, he found support for his existing equipment was getting weak. "The support I get from Kleemann and Linder Industrial Machinery Co. has been fabulous," he said. "It's of excellent quality." Edited by Rock Products from material contributed by Klee- mann/Wirtgen Group.